Our assorted hens are busy in the yard most days, scratching and pecking. 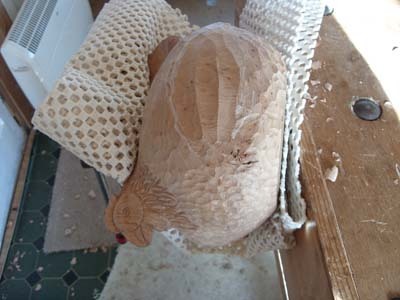 Sometimes, however, one will decide to become a little bit broody and settle herself in one of the nesting boxes, when she becomes fluffed up and rounded in shape as she sits snuggled up in the straw. 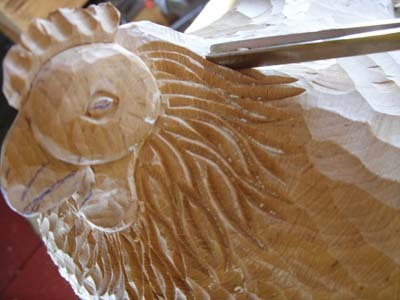 A broody hen is a nice project for a weekend, and can be carved any size you like depending upon the wood you have available. 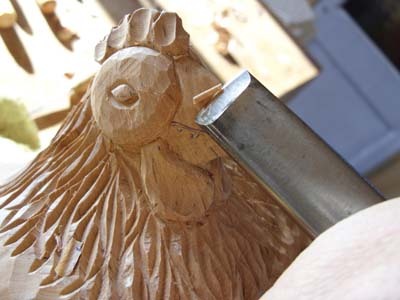 The techniques are the same; just use smaller or larger tools. 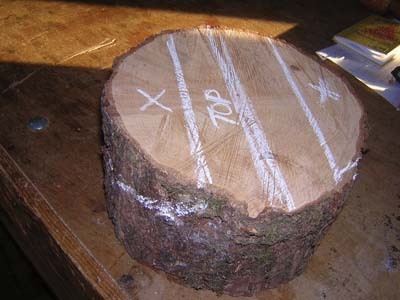 From my firewood pile I chose an alder log (Alnus glutinosa) 255mm (10in) diameter and approximately 180mm (7in) height, an unusual timber which becomes a lovely tan colour when oiled or polished. 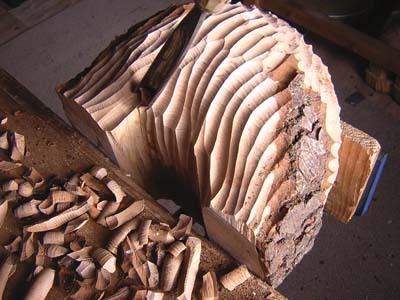 As long as it is sound you can use any type of wood of any size that will fit securely in your vice whilst you are working. 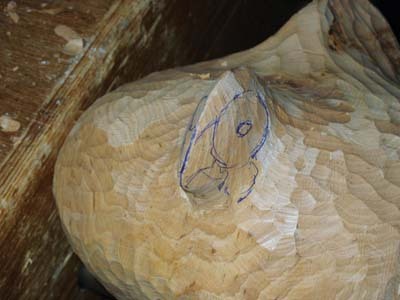 Look for a section of log with a diameter of approximately one and a half times its height, and there is no need to remove the bark before you start carving. 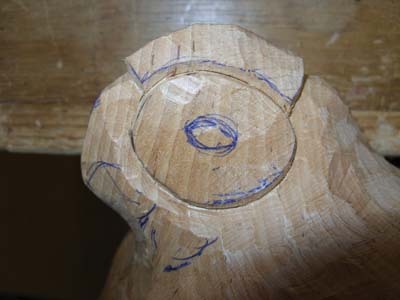 On the rear end, mark the tail as a triangular area. 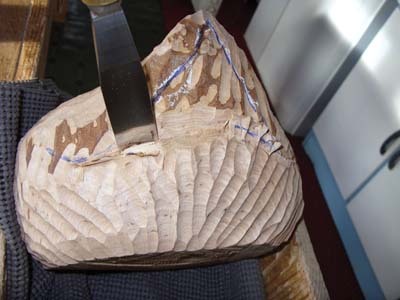 Cut a channel along the curved path along the bottom of the triangle using a 1/2in or 3/4in No.3 gouge (see gallery image 7). Make the channel deeper in the middle (see gallery image 8). 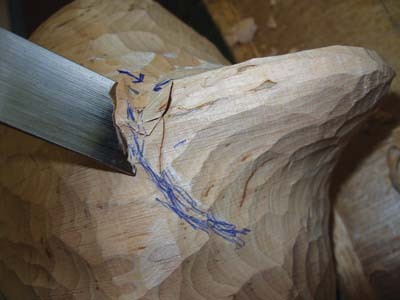 Cutting towards the channel, begin hollowing the triangular area using the No.9 gouge (see gallery image 9). 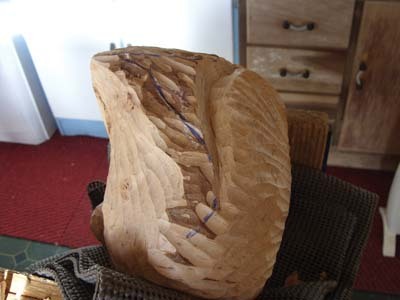 Re-cut the channel deeper across the base of the tail and repeat the scooping process. Round over the lower edge of the channel into the hollow. 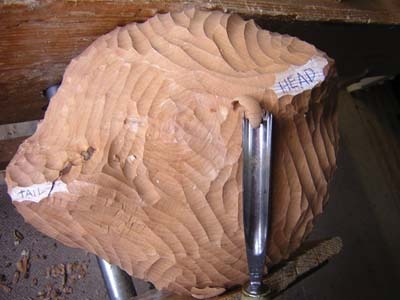 First, the head is shaped into a disc by rounding the front and the back of it with the 1/2in No.3 or 5 gouge and cutting towards the top of it until it is no longer flat on top. 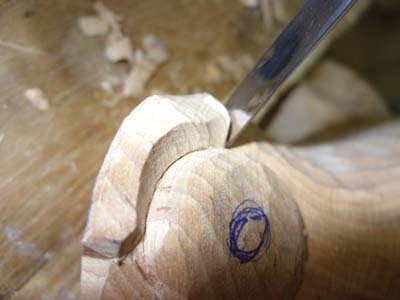 Cut a channel across the throat, curving to each side of the neck using the 1/2in No.3 gouge (see gallery image 11). 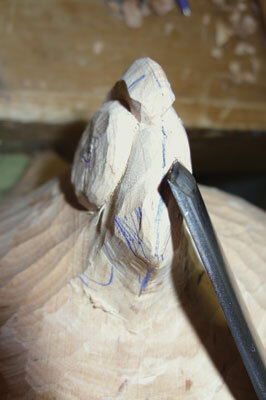 Cut back into the channel towards the breast to undercut the head/beak area. 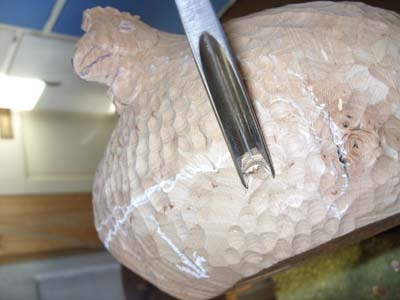 Round the upper edge of the breast into the channel. 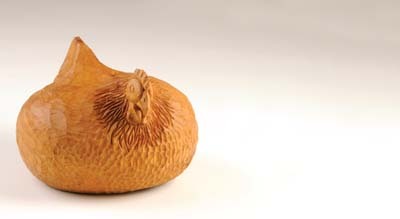 The head should be disc-like when viewed from the side, and the breast rounded into her neck (see gallery image 12). 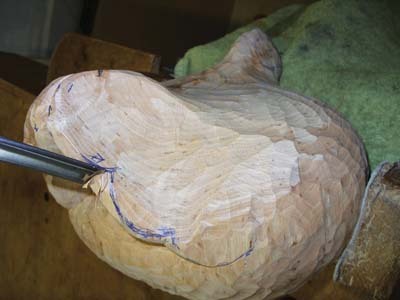 Pare the top of the tail from all round until the original sawn surface has been removed along the top, then using the V-tool, cut the separation between the two main tail feathers at the tip of the tail (see gallery image 13). 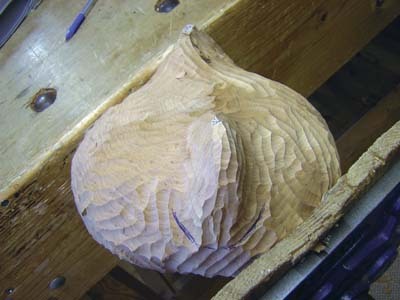 Scallop each edge of the tail to delineate the tail feathers and round over the ends of the feathers using the No.3 gouge inverted (see gallery image 14). 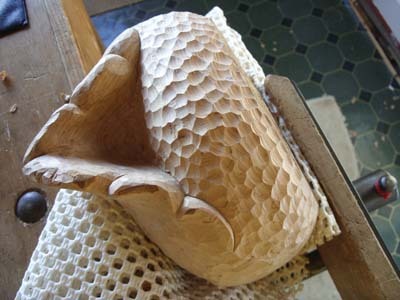 With the V-tool, cut round the face and towards each end of the comb. 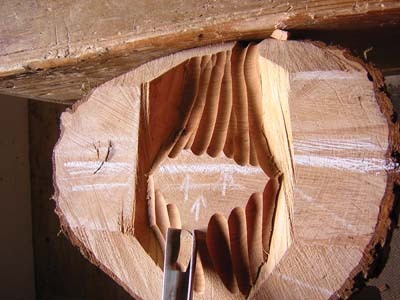 Using the 3/8in No.3 gouge with opposing cuts, deepen the V-cut then remove its adjacent surfaces, including both ends of the comb (see gallery image 15). 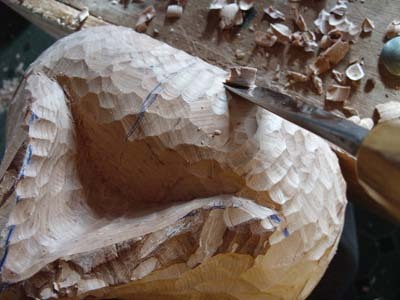 Round over the edge of the face into the now deepened channel, and repeat the process, cutting back deeper at the base and both ends of the comb. 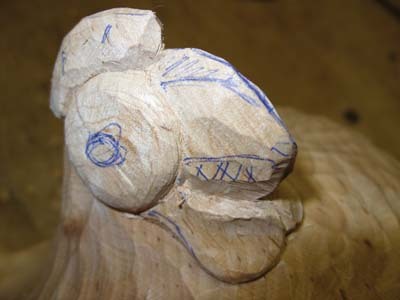 The comb stands proud of the top of the head (see gallery image 16). 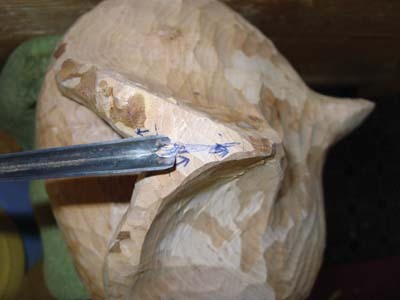 Smooth the surface of the face and beak using the 3/4in No.3 gouge inverted, and repeat the procedure on the other side of the head (see gallery image 17). 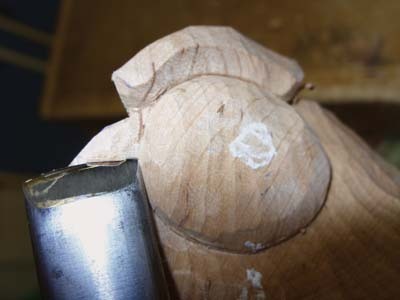 Paring with the 3/4in No.3 gouge, narrow down each side of the beak to make it symmetrical with an apex along its length (see photo 18). 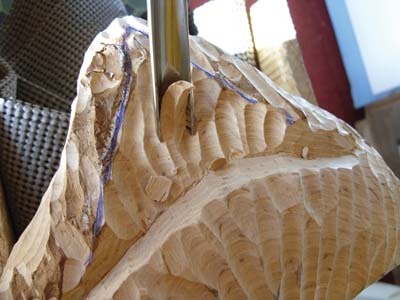 Remove any remaining errant cuts, splinters or sharp edges through careful paring. 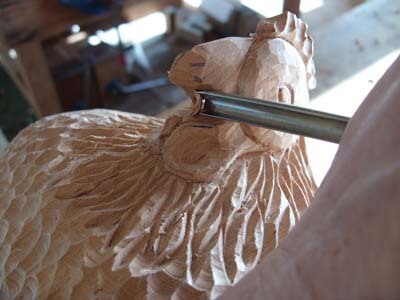 There are several finishes that could be applied - I used linseed oil to bring out the deep tan colour of my alder wood (see gallery image 27), though Danish Oil would be just as suitable, as would a light wax polish which could then be buffed to a shine using a soft brush. 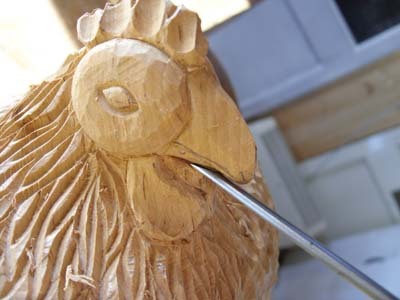 Your hen is now ready to nest!